What if - Do one exercise a day from "What If?" and you'll be writing for more than a third of a year. The book is packed with 115 exercises. Indispensable. How to Write a Damn Good Novel - Rewriting is what separates the pros from the amateurs. Frey finishes everything off with the most important thing it takes to become a great writer. The Art of Fiction - Because Gardner strives for "higher art", his musings and instructions for the beginner go much deeper than ordinary how-to books. A must for all novel writers. Stein on Writing - "Your job," says Stein, "is to give readers stress, strain, and pressure. The fact is that readers who hate those things in life love them in fiction. Bird by Bird - Lamott's suggestion on writing the novel is down-to-earth: worry about the characters, not the plot. Writing is more rewarding than publication. Easy for her to say? Writing the Breakout Novel - Maass forces writers to take a hard look at the quality of their work. Great for beginners. Self-Editing for Fiction Writers - Adhering to "show don't tell," the text includes both good and bad examples, and at the end of every chapter is a tip checklist plus exercises. Novels by Will Lavendar, John Ford, Susan Breen and Christine Meldrum have all found publishers and lucrative contracts. Congrats! ... Read new in-depth interviews-- Algonkian attendees discuss their novels and the conference. Seven Mountains Writers Conference Oct. '07 - "From the Heart, but Smart - Premise, Platform, and Execution" - Agent Pitch Sessions With Peter Rubie, Tina Wexler, and Eve Bridburg, ERP Media, Intensive Craft + Pitch workshops. NYC Pitch and Shop Conference upcoming in Sept. Writers pitch the novel to major publishers. See the NYC Pitch and Shop NEWS PAGE for the latest. Author Julie Kaewert talks about her Algonkian experience at the Seven Mts. Writers Conference. Julie is the author of the Booklover's Mysteries featuring Alex Plumtree and Plumtree Press. She is currently at work on a historical fiction work entitled, The Writing Masters Daughter. Writer Greg Haas talks about his new project. "After nearly 30 years as a political consultant (much of it in Ohio a microcosm of the nation) I've watched and learned from some of the best political strategists in the world. I've spent a great deal of time listening to the people they influence. I felt I could tell a story about how the process works." Interview with author Kate Gallison on the subject of Algonkian and the NYC Pitch and Shop, as well as her new novel, Massacre at Bitter Wash. 1909 is a year of fierce competition in the infant silent movie industry, where Thomas Edison's Motion Picture Patents Company harasses independent moviemakers with lawsuits and sabotage. Author Thierry Sagnier yearns for the Paris of yesterday. The project I am currently working on, Montparnasse--Nights in Paris, deals with Paris shortly after World War I. Artistically, Paris was the center of the universe then. It's a period of history that fascinates me. Our very own Mark Budman of WDS interviews T.C. Boyle. A new Literary Dialogues first with the nonesuch Boyle. As T. C. says, a good novel "delivers art and beauty along with the punch of entertainment." It's that simple, and that difficult. From our mother site, WebdelSol.Com. Great interviews with truly literary writers such as Ducornet, Almond, Bender, and more. Lofty goals here. Books! Books! Books! Why Read? The indie bookers include a best picks page. A must for serious writers of all genres. High literary works reviewed and going back several years. Reviews are a bit too positive at times, but c'est la vie. A-Z, loads of reviews and much more. The place for "all things chicklit." The genre is expanding. Both English and American historical fiction here. Excellent starting place. Five stars. A creation of Webdelsol.Com. FIVE LIVE blogs like Maud, Powell's, Beatrice, and more, + a list of the best + a remarkable blog search engine. If you want the real dig on a new novel, the bloggers are waiting for you. No fancy cosmetics here, but MR gets the job done. Great capsules, archives, + all sub-genres. Learn from the many-stars and one-stars too. A "scoring" site for literary commercial books. Check the scores then hit the blogs. Includes only the top reviews. Any bias here? We're not sure, but it's a good place to start. You might not agree with all the SFC book reviews, but they won't stop coming. Good archives. All genres plus non-fiction. Worth comparing to MetaCritic and blogger reviews. An explosion of book reviews on the very first page. Begin your search here. YALSA, yowza, the best of the year list, plus check out Reading Rants for their latest reviews by category. Anthony Policastro talks about upsides and downsides to email submission. Writers bring their manuscripts, attend pitch shops, and then pitch their novels to top Editors from Holt, Scribners, Viking, and more. 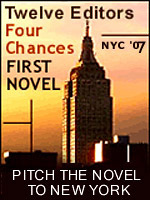 A HUGE opportunity for aspiring authors at the NYC Pitch and Shop. "Floating in Space and Time"
Updike vs. Wolfe and Almond vs. Ellis, etc. Pithy Pam: Do You Know One? Writer Tom Meek tells us a true story from the darker side of writing groups. Necessary notes on finding your niche.